Four decades of innovative musical technology poured into millions of acoustic and electric guitars has made Taylor Guitars a leading contender in instrument manufacturing. The company has equipped world-renowned artists from Taylor Swift and Jason Mraz to Black Sabbath’s Toni Iommi with well-crafted, easy-to-play guitars. With more than 900 employees, the company produces hundreds of guitars per day in its state-of-the-art factory complexes in both El Cajon and in Tecate, Mexico. For the third consecutive year, Taylor Guitars will open its doors alongside 30 other regional manufacturers to celebrate National Manufacturing Day on October 2. 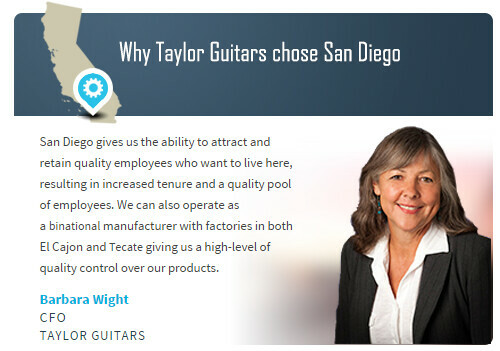 This week we talked with Barbara Wight, CFO of Taylor Guitars, about why the company chose San Diego. Tell us what your company does. 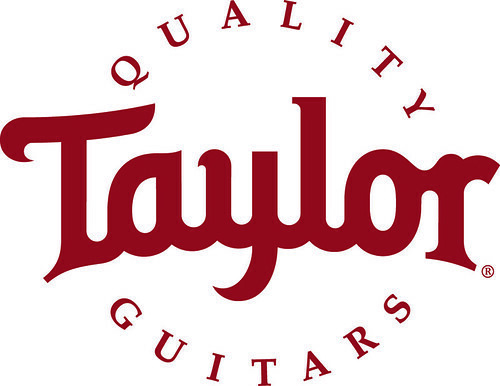 Established in 1974 by Bob Taylor and Kurt Listug, Taylor Guitars has evolved into one of the world’s leading manufacturers of premium acoustic and electric guitars. Renowned for blending an innovative use of modern technology with a master craftsman's attention to detail, Taylor guitars are widely considered the best sounding and easiest to play in the world. The company was a pioneer of the use of computer technology, lasers and other high-tech tools and machinery. Today, Taylor Guitars is widely recognized throughout the musical instrument industry as the visionary acoustic guitar manufacturer. Outstanding playability, flawless craftsmanship, and stunning aesthetics are just a few of the reasons that many of today’s leading musicians make Taylor their guitar of choice. What are some advantages to being located/doing business in San Diego? Since the company’s inception, Taylor has remained located in San Diego as it gives us the ability to attract and retain quality employees who want to live here, resulting in increased tenure and a quality pool of employees. Along with this, we are able to operate as a binational manufacturer with factories in both El Cajon and Tecate giving us a high-level of quality control over our products. Deering Banjos is known throughout the world as a leader in its product class, and for good reason. Founded in the same shop as Taylor Guitars by Greg and Janet Deering 40 years ago, the company has continued to thrive in San Diego. If you turn on the TV or look in any entertainment magazine, alongside the acoustic guitar, Deering banjos are the instruments du jour of some of today’s biggest acts. What do you anticipate for your company in five years? What do you anticipate for San Diego? As a company, we anticipate additional growth in size, capacity and market share. We will continue to grow our brand presence and the true ‘Taylor experience’ in additional regions in the world. We expect San Diego to continue to be a world-class location for both businesses and families.